Do you use a huge email in-box? All of us do these days. 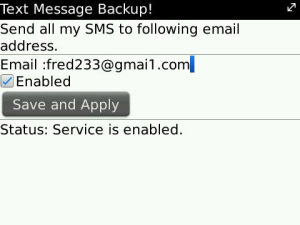 "Text Message Backup" will forward all your incoming Text/SMS messages to your email in-box. You will never lose a text message even if you loose your phone. All messages landing in your phone will be forwarded to an email address of your choice. In case the app is not working for you try following Permissions solution or write to us on Linky v URL mohou vidět jen registrovaní uživatelé. Přihlaš se nebo registruj na fórum. .
* A running GSM connection and SIM card inserted to receive text messages. * Permissions granted to the app as a trusted app that can receive SMS and send Emails.